The South London and Maudsley NHS Foundation Trust (SLaM) has attempted to cover up what happened during two related incidents on a mental health ward. On the night of 2012–10–01, at its River House facility, 48 Metropolitan Police Service (MPS) officers were deployed, including officers from armed and dog units, and four Territorial Support Group (TSG) officers drew their Tasers on the mental health ward. The police cannot find its own investigation report. SLaM has eventually published a version of its investigation report with many fewer redactions remaining, in response to my multiple freedom of information requests and an eventual decision notice of the Information Commissioner’s Office. You can now find out much of what they didn’t want you to know. p. 29 in the 2014 and 2015 versions of the report. What follows are excerpts from the SLaM investigation report which were blacked out in the earlier more extensively redacted release. ’Patient B [a black patient], had by this time, calmed down considerably and although remained verbally threatening and abusive, obeyed police instruction, sitting on the floor with his arms above his head allowing the police to handcuff him. The police placed a clear plastic cover over his head to prevent him from moving his shoulders and elbows. He was initially ignored by the police until several promptings by staff. 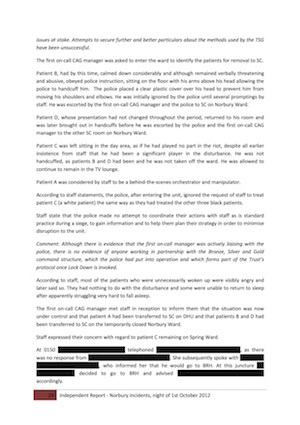 He was escorted by the first on-call CAG [Clinical Academic Group] manager and the police to SC on Norbury Ward. Patient C [a white patient] was left sitting in the day area, as if he had played no part in the riot, despite all earlier insistence from staff that he had been a significant player in the disturbance. He was not handcuffed, as patients B and D had been and he was not taken off the ward. He was allowed to continue to remain in the TV lounge. Patient A was considered by staff to be a behind-the-scenes orchestrator and manipulator. ’TSG entered Spring Ward from the fire road entrance via the airlock leading to the ICA and to the main ward in “strict compact riot formation (regimented crowd control)” armed with shields, visors, batons and Taser guns. Taser guns were not used. ’At 2317 a third call was made to request ‘riot police support’ - CAD 9864. This was recorded on the police log as three patients had started rioting in the first instance and that all thirteen (patients) had now joined in; that suspects had metal poles and were trying to break the windows where the staff had retreated for security and that if the patients broke the windows, the staff would all be killed because patients had committed murder before. ’A decision was taken to prepare oral prn midazolam 10mg as well as to draw up 7.5mg of midazolam for intramuscular injection. This was because the team determined there be to be a likelihood of patient D refusing oral medication. This was based on previous knowledge of him. ’patient B smashed the oral medication out of the hand of the UC, spilling all the medication and water on the floor, along with the intramuscular medication, which according to some statements was concealed out of sight when it had been taken as a contingency measure, should patient D refuse oral medication. 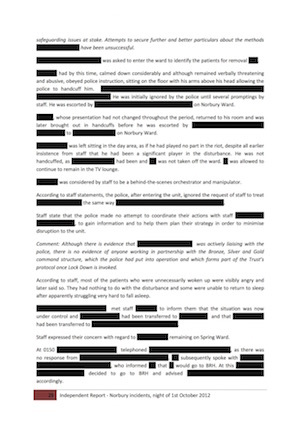 So far, it has taken eleven freedom of information requests (to SLaM, the MPS, the Independent Police Complaint Commission, the Care Quality Commission and to Monitor), too many complaints to the Information Commissioner’s Office and a decision notice to uncover what has just been exposed that the South London and Maudsley NHS Foundation Trust and the police didn’t want us to know. Some of these revelations are shocking. 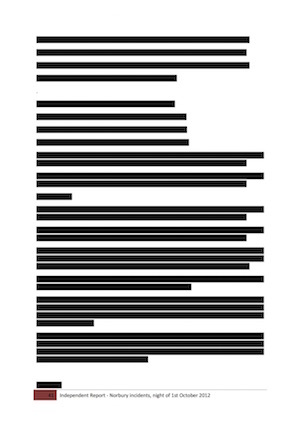 There are still some redactions, which are likely unwarranted and, if so, in breach of the the decision notice of the Information Commissioner’s Office. The only valid exemption, agreed by the Information Commissioner’s Office, is for third party personal data which explains that most names are still redacted. It is more difficult to understand how the use of this exemption can be justified to miss pp. 39–67 from the table of content (on p. 2), and that from the middle of p. 40 to the middle of p. 65 the content is still entirely blacked out. From the headings just before and after these redactions, the redacted text must concern some of the findings of the investigation. And also some of the internal SLaM correspondence and internal MPS correspondence about my earlier FoI requests. First published on 2015-04-06; last updated on 2015-06-24 to add details about compliance of remaining redactions.